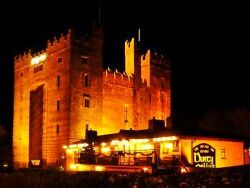 Bunratty Castle is one of the best restored medieval castles in Ireland, and for castle fans a visit here is an absolute feast. 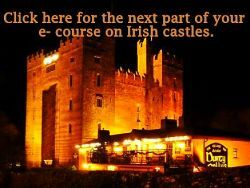 No other castle is so much part of Irish culture. Be prepared however- this stunning and beautifully restored Irish castle betrays a bloody history that is very much ‘Game of Thrones’. In short, violent, bloody and quite horrendous. Since Viking times the location near the Shannon estuary had been seen as a strategic point. The first invaders to settle here and develop extensive trade links were the Vikings. They were followed by the next wave, Norman invaders in the 13th century. The first castle at this spot near Bunratty town, which then had probably around 1,000 inhabitants, was built by Thomas de Clare who was given the lands by Edward I. A lot of the natives were pushed out which set the scene for the conflicts to follow between the native clans of the O’Brien’s and McNamara’s and the local Normans. 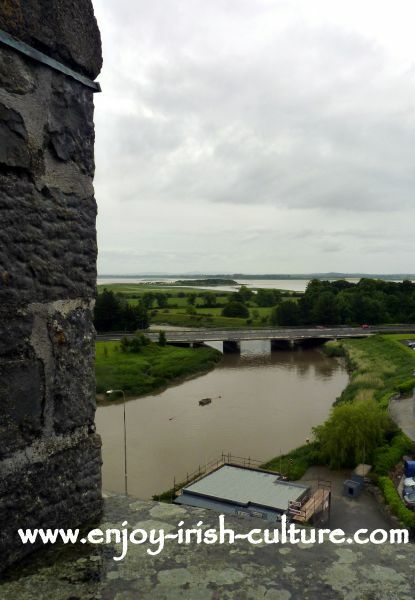 View from the battlements of the castle onto the river once called 'Raite' which gave Bunratty its' name. Note the river Shannon in the distance. At times they would be allies, but when allegiances shifted it got rough. At one point in 1277, Brian Ruadh O’Brien felt usurped as King of Thomond by his nephew, Turlough Mór. He attempted to enlist the support of the neighbouring Normans in recapturing his lands. When invited to Bunratty Castle as a guest of honour he had no suspicion, and no inkling that this would be his last day alive. After elaborate rituals to ensure their bond, including pouring their blood into the same vessel and swearing vows, de Clare had Brian Ruadh seized and killed in the most brutal way imaginable, torn apart by horses. His head was cut off and his body put on show on a tall post at Bunratty. This story has been passed down to present day in the Annals of Lough Key. 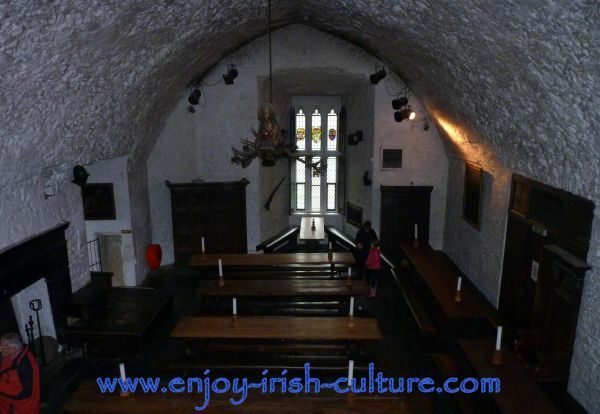 Compare a similar bloody castle history- that of Claregalway Castle. After this episode, both the O’Brien’s and McNamara's hatred for the Norman lord deepened and they launched regular attacks on the castle, destroying it at one point, and finally driving the Normans out of the area in 1318. 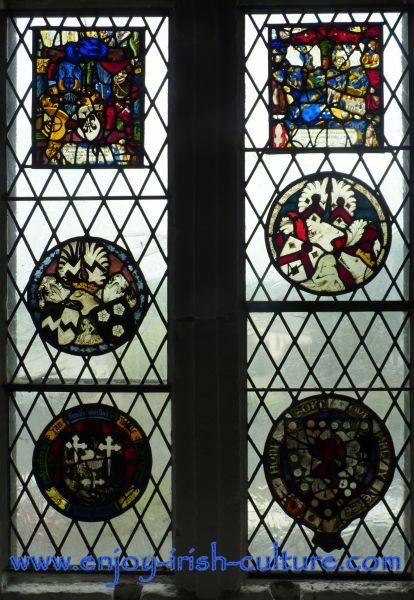 When leaving for England on ships, the surviving Normans set the castle on fire. 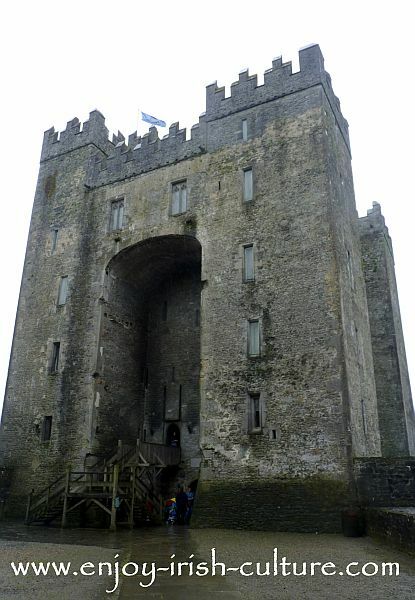 After that, Bunratty castle was in Irish hands for the next two centuries. The O’Brien’s, after swearing loyalty to the crown eventually received aristocratic titles. Over the 800 year history of the castle, it was destroyed eight times, and rebuilt on each occasion. The castle as we know it today dates from the 15th century, and is built in the tower house style with a central keep, which has four towers added onto it, one at each corner. The central keep contains large halls, where the towers contain the smaller, private quarters. Hall at the castle where medieval banquets are held these days, accompanied by musical entertainment by actors. After the big house was built on site, the owners of the castle moved out. The castle was left to fall to ruin. When the roof collapsed eventually, it was a big story locally. Lord Gort purchased the castle ruin in 1953 for a nominal fee when it was in danger of being demolished. He had a deep interest in Irish medieval history and took on the massive project of reconstructing and furnishing the castle building. 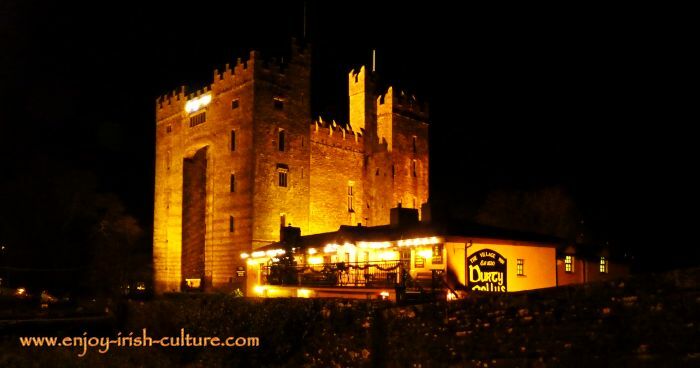 Lord and Lady Gort donated Bunratty Castle to the Irish nation. Hi there, you like what you just read and looked at on this website? Why not tell all your friends about it so that they too, can enjoy this content? We have some easy to use social features on this website at the top left and at the bottom of pages, so that supporting us will only takle a few seconds of your precious time! Many thanks and warmest regards, Susanna and Colm!